As you will quickly be able to tell, these are LARGE image files. Please be patient while they load or view these images on my Yahoo news group in a smaller format. There is a good deal of detail in this piece that is well worth viewing in the largest image size possible. I hope that you enjoy! 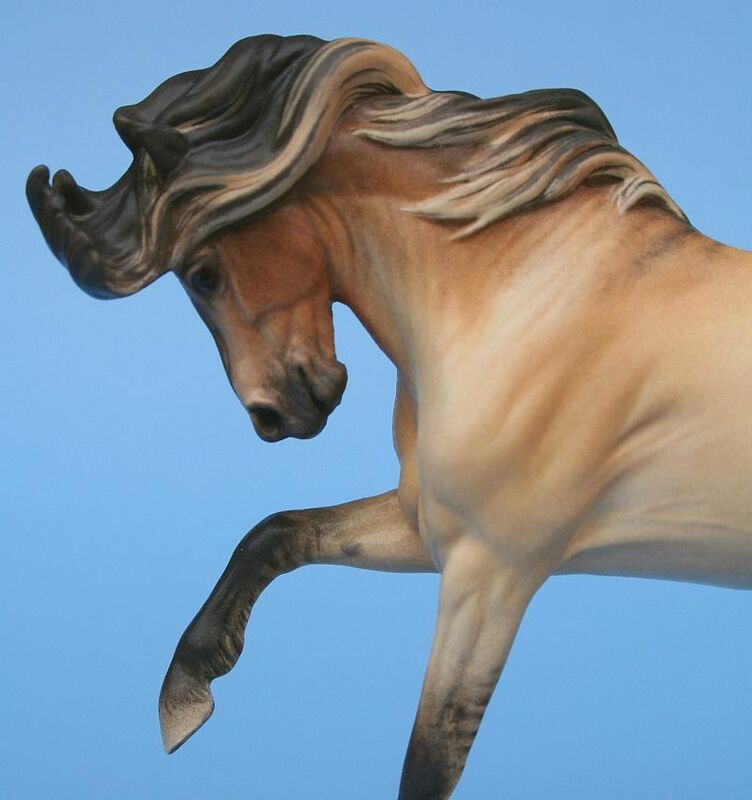 This is the mini "Spinnaker" grade or pony gelding sculpture by the incrediably talented Sarah Minkiewicz-Breunig. 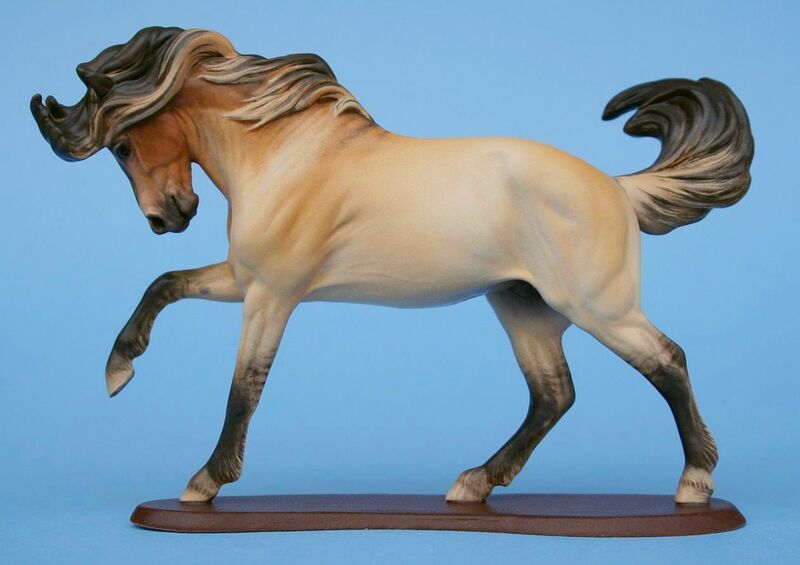 Probably my all time favorite mini to date, this fantastic piece was first produced in unpainted resin through the Realistic Equine Sculpture Society. In late 2006 this sculpture was then released in a very, very small edition of earthenware ceramic. The first several pieces were offered for sale with custom glaze finishes by Adalee Velasquez and Joan Berkwitz. Then 18 unglazed bisques were made available through RESS to glazing artists by lottery. Each of us who were able to purchase these bisques could buy up to two pieces each and glaze them for the 2007 RESS custom glazing finishwork contest! This piece has been entiredly kiln fired to a linebacked yellow dun with bicolored mane and tail by myself, Paige Easley Patty of Hanblechia Studio. With his color inspired by photos of a lovely Kiger mustang stallion, I envisioned this piece pawing the ground on top of a windy mesa. 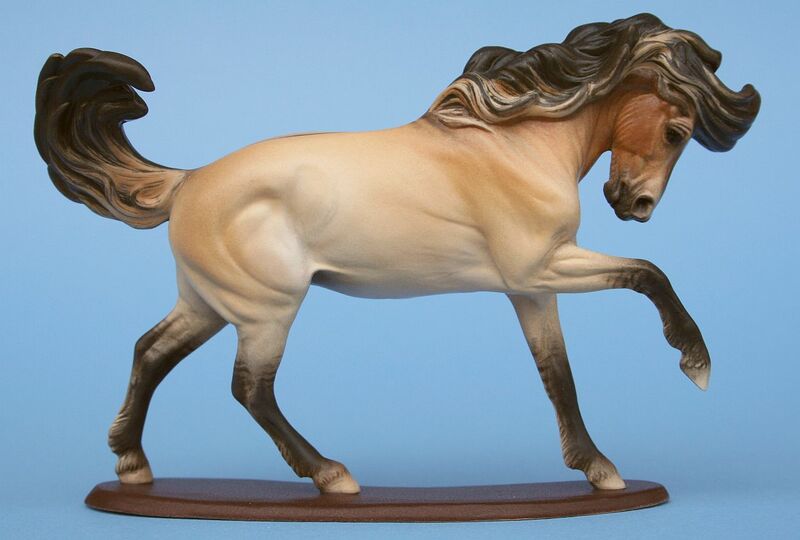 This piece includes a new overlaying technique with lighter underglaze applied over the roots of the dark mane and tail base for the dun frosting effect. Although I had tried this technique before on a Wee Bairn sculpture for a client, this is the most successful attempt I've tried so far. I had hoped to be able to keep this piece, and if fate allows I might yet. Although the details on this piece didn't come out as sharply and clear as I might have liked, I couldn't have been more pleased with his rich and subtle color. 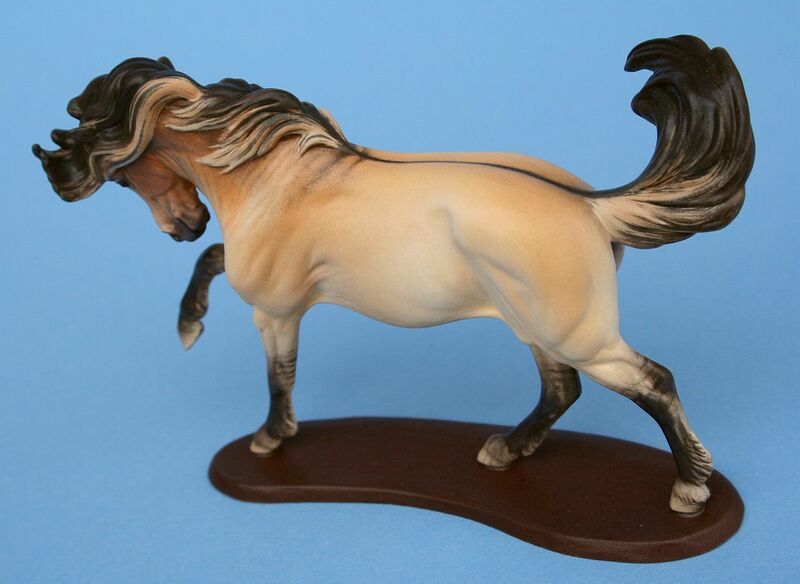 Far more sutble and rich than my camera could capture, he is complete with a variety of browns and black in the darkest areas of the mane and tail, and very subtle highlights and shading in the flanks. Other detailing includes hints of hair pattern in the faded leg feathers, neck wrinkles and shoulder bar, dorsal stripe with barbs, and leg barring. I went to great length to photograph this and my other glazed Spinnaker WITHOUT glare so that they look very matte finished in these photos. They are actually satin in finish and a bit shinier in person.